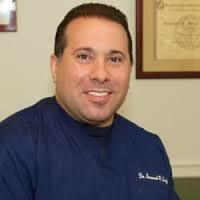 I had a patient come in this week that I scheduled for bunion surgery that was not having pain. However, she was not scheduled for cosmetic reasons alone. She had severe bunions. She complained of not fitting into some shoes but she was okay with wearing less stylish shoes that did not hurt her bunions. So, why would I schedule surgery on her if she had no pain and she did not complain of not fitting into shoes that she wanted to wear? Cartilage is the very smooth tissue on the ends of bones inside of the joints. Cartilage allows bones to glide with very little friction against each other in the joints. 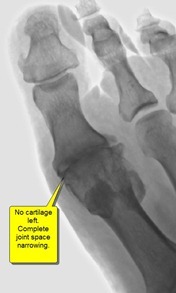 On x-ray cartilage does not show up. It looks like clear space between the bones. When there is arthritis, the cartilage gets worn away and the bones appear closer together. When the cartilage is gone there is no space between the bones and they look like they are touching each other in the joints on x-ray. Clinically, when the cartilage is gone, one feels a grinding of the bones or what we call ‘crepitus’ in medical terms. By the time one has crepitus there is almost always pain associated with movement. 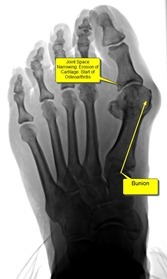 The reason bunions result in arthritis with wearing away of cartilage, is the joint is not functioning correctly. The bones intersect at an angle to each other and that results in uneven forces on the cartilage, causing erosion over time. Let’s go back to my surgery patient who has no pain… She had signs of arthritis on her x-ray. The space between the bones was decreased. We call this joint space narrowing. I advised her that she should have surgery because once the cartilage is gone, there is no way to get it back. Once this happens, patients require bigger surgical procedures and have a worse prognosis to be pain free after surgery. There are basically two types of cartilage one can have in their (toe) joints: Hyaline cartilage and fibrous cartilage. Hyaline cartilage is the good kind that you are born with in your joints, and the kind I referred to above that gets worn away when one has arthritis. The second kind, fibrous cartilage, is not really cartilage in my opinion. It is more scar tissue inside the joints. When we (doctors) say we will do surgery to increase the cartilage, this is the kind we are referring to. We drill holes in the hard bone inside the joint in order to create the growth of fibrous cartilage as scar tissue from the drill holes in the bone. Fibrous cartilage does not function as well as hyaline cartilage, but it at least forms a spacer between the bones that is softer than the bones rubbing on one another. So, to answer my question above, I recommend bunion surgery to patients that have no pain when there is progressive cartilage erosion, with arthritis forming in the great toe joint.